Today we upgraded the SSCA® SIP training program. The majority of the changes in all of the modules were 'broken link' fixes and other changes that bring the content up to date. We also included some changes to the Wireshark module where an example client that is no longer available was replaced for a newer one to try out. Microsoft Teams is also mentioned in the SIP trunking module so you can see how SIP trunk connectivity is possible. Today we upgraded the SSCA® SIP training program which includes a number of updates such as new content, some old content removed, bug fixes and new labs. Some of the MAJOR changes are as follows. For ALL of the detail, please download THIS PDF document and look for the Blue Text in BOLD…. That’s everything that we have changed! The SIP Security Module has changed to Security and Identity. This is to reflect the main addition of training on the STIR/SHAKEN initiative that aims to reduce/stop Robocalling and other nuisance calls. This module has been renamed to ENUM, Peering and Interconnect. This has been done due to more being added on how peering works as well as the inclusion of training on IP-NNI from ATIS and the SIP Forum. We are really pleased with these new changes that reflect how SIP continues to evolve and underpin the world of communications. We hope you like the new stuff and we're continuing to work in the background on more updates that we intend to release soon. New Certification badges are now available! We’re really pleased to announce the update to our certification badge which if you have passed a certification test with us, you can display on your email signature, business card and maybe other places on the web - social media sites etc. The change was brought on first through the update to our SIP and Cloud program and then carried on through the SIP and Networking for VoIP programs (WebRTC is coming at a later date). Of course we liked the old badge, it’s just that we think the new ones are more compact whilst being more eye catching thus drawing people’s attention to your achievement. We do hope you will logon to the system and via your History settings, download the badge and display it for people to see. We’re currently working on some upgrades to the training software that we will be rolling out over the next few months - a module (or two) at a time. Today sees the update for SIP with Communications going live. We’ve made a number of changes to the module which mainly consist of changing the software clients used to demonstrate presence and messaging. We’ve also introduced an element of UCaaS as well as fixing a few minor bugs. We hope you like the changes and stay tuned for more really soon. The SIP survey’s purpose is to take a look at SIP trunking and specifically, to document the most common issues that occur during SIP trunk implementations and what can be done to help mitigate these issues, if at all. Inputs are collected from vendors, service providers, integrators, resellers and also from small to enterprise clients from all around the world and the results of the survey are now available at this link. Thanks again to all for participating. Last year we reached 1098 respondants and this year we want even more. The SIP Survey 2016 is now online and available to complete at https://www.thesipschool.com/survey2016collect.html. The plan is to collect responses until the middle of October then to compile / analyse and report at some point at the end of October. Your help is most gratefully appreciated and there will be a prize draw at the end of the process where 3 people will win a training program of their choice from our website. Thanks again for being part of this most informative of surveys. So we've been working hard at updating the old SIP Communications for Sales program and included a lot more on Cloud, Mobility and other material to bring this program right up to date. To reflect on the emphasis in selling Cloud services as well as UC and SIP trunking we've both changed the name of the course and the certification test. The program is designed for anyone involved in the sales process for communications services today whether on-premesis, in the cloud or a hybrid solution. Also, existing certification holders will be able to use the new SSSP™ logo that is the first of a rebranding program for all of our courses, stay tuned for more. Exam Review is now available! From today, there is now an exam review option that students can use once they have had a test marked. We've added this as it will allow people to see what they got wrong (as well as right) so that if they need to, they can refocus their efforts on passing their exam. We hope that people will use and like this feature and think it will be a success. Networking 4 VVoIP is updated! So our Networking course has had more than just a content refresh, it has had a facelift with regards to the course look, feel and menu design. It's also now iPad compatible with full HTML5 support. The course content can be found in this PDF and don't forget the demo as well which includes a free module on DHCP. The SIP Survey results are out..! Earlier this year, The SIP School carried out it's annual survey to find out what's really happening in the world of SIP and SIP trunking. We do this to see what problems people are getting and to work out what people need to do in order to get SIP Trunking right the first time. We found that problems ranged from Codec issues, No - Audio, Failure to keep systems patched, Call transfer issues and many many more. We even threw in a couple of questions on WebRTC...! Hope you find it both interesting and useful. New SSCA® Q/A have been uploaded today to reflect the new content that was uploaded over a month ago. A BIG day here at The SIP School as the SSCA® SIP training program is updated…! We’ve updated most modules with their specific changes found in the Outline Doc where the new stuff is in a Bold Blue font. NOTE for SSCA exam takers… The changes to the training will NOT be reflected in the SSCA® certification test until the 24th March. This means that if you are preparing to take your exam soon, the new stuff will not be part of the test at this point in time. New site, New content, New format...almost! Well, if you haven’t noticed by now we have a NEW website…!!!! This has taken a while to produce and we really hope you like it. We’ve designed this system to look great on all devices including tablets. With that in mind, if you have a tablet device such as an iPad, our Sales course is now in HTML5 format and will run natively. It’s in BETA at the moment so let us know if you come across any issues. Other courses will be HTML5 soon. One of The SIP School’s many good friends in the ‘Comms’ industry is Broadsoft. Using their Packetsmart system you now have the ability to run ‘real' VoIP (and Video) simulation tests to determine if a WAN link has the capabilities of carrying your desired VoIP traffic or in other words, a full SIP trunking assessment test. This testing system has been provided for free for students to use and we’d like to thank the team at Broadsoft for all their efforts in making this available. The system is accessible from within the module SIP, VoIP and QoS. If you are planning to take your SSCA® exam, then new questions relating to the new content (not including Packetsmart) will be added to the testing system database on the 20th of August and you may see these questions appear in your test. If you take your test prior to the 20th of August you will not see questions on the new material. the SIP Survey is out! It's a great read that highlights what's happening in the SIP trunking space, what are the issues that people are facing along with suggestions, comments and quotes not only from us at The SIP School but from other respected thought leaders in the industry. This year, we’ve even added in a couple of questions on WebRTC! SSCA® SIP and SSMP™ exams have been updated with some new questions today that relate to the new content uploaded on the 15th January. As our Q/A database holds in excess of 300 questions which are then selected at random for each test you may or may not be presented with the new questions for your own individual test. Well today is when all the new updates to the SSCA SIP and SSMP Sale program are uploaded and available. All modules have had some general fixes i.e. link updates etc. with module specifics being. SSMP Training changes are all related to bringing the material up to date with regards to companies who may have added / changed their SIP Comms services and even some of them who have merged with others. NOTE: Updates to the SSCA and SSMP exams will be applied on the 3rd of February. Minor changes to the 'Testing Troubleshooting and Interop' module where references to sipgate.com (in the USA) + all configurations relating to this service have been replaced by other references. Sipgate in Germany and the UK continue (at this point) to offer SIP services. On Monday the 30th September, the latest round of updates will be uploaded to the training system for the SSCA® SIP training course. There are a few content changes to the program (listed below) that do not affect the current SSCA® certification test, so if you've already studied a module, you don't have to repeat it. Most of the changes are cosmetic with new images and an improved 'theme' throughout. We've also fixed a lot of bugs such as broken links, references to old software and old IETF documents. So we’ve been working hard, really hard to complete the WebRTC School ‘package’ and we’re finally there. Today (September 12th) is the day that the WebRTC Developer training and certification program is ‘live’ on the site www.webrtcschool.com (and other sites inc. www.thesipschool.com) and it’s packed full of instruction, demos and ‘real code’ to help the developer get up and running with writing WebRTC applications. For a full demo and content pdf, click here. Of course WebRTC is not a ‘finalized’ specification but we’re on the case as we’ll be updating the training as things develop. Associated with the training is the WebRTC School Qualified Developer (WSQD™) certification test that is supported by industry giants such as the TIA, USTelecom, WebRTC World, Comptel and many many more including manufacturers such as Genband. So now there are two programs. WebRTC School Qualified Developer – WSQD™ and WebRTC School Qualified Integrator – WSQI™. If you want to do both there is a great offer of 20% off the ‘package’ price so you really can get to know WebRTC and show the world your skills via the qualifications. Students of the ‘Developer’ program are encouraged to take the code shown and see what they can add to it (or even completely re-write it) and then to post information via the WebRTC School Facebook page here, www.facebook.com/webrtcschool - we’re hoping to see some good ideas very soon. The Website has some nice touches as well with a new page that showcases the most prominent bloggers/writers on WebRTC such as Phil Edholm, Alan Johnston, Tsahi Levent-Levi and more. We added this as we are looking to continue to enhance the WebRTC learning experience with extra features. So that’s it, we’re 'live' and I want to thank all of the team here at Vocale Ltd as well as our esteemed content providers for their tireless efforts in getting all of the WebRTC programs ready for students to get learning. I had an interview with Tsahi Levent-Levi who is one of the most prominent bloggers and advocates regarding WebRTC out there. You can read it here http://bloggeek.me/webrtc-training-interview/ and also be sure to check out his WebRTC blog here http://bloggeek.me/. WebRTC School is 'LIVE' ....! WebRTC is the hottest topic in communications today and The SIP School now has a 'sister' site in WebRTC School. As you can imagine, this is a big day for us here at Vocale and we think that this new school is going to be every bit as successful as The SIP School in providing students with all the knowledge they need to both understand the ‘underlying’ technologies that make the WebRTC ‘magic’ happen as well as learning about WebRTC APIs and of course, how to develop WebRTC applications. If you have any more questions about this exciting new training / certification service then please send an email to graham@webrtcschool.com or use the contact page on the website. On August 26, ITEXPO and WebRTC School will team up and host a WebRTC pre-conference training and certification dedicated to WebRTC. The training program will be held at ITEXPO Conference at the Mandalay Bay in Las Vegas, Nev. The event will feature noted WebRTC authors and industry leaders who will conduct a full day of education and training in WebRTC. All registrants will get access to the WebRTC School online training and certification for Web Developers. For more information or to register, visit the ITEXPO Registration site. It's a great read that highlights what's happening in the SIP trunking space, what are the issues that people are facing along with suggestions, comments and quotes not only from us at The SIP School but from other respected thought leaders in the industry. WebRTC has become the hottest topic in the world of communications today and of course there will be a demand for training on both how WebRTC works and how to develop WebRTC applications. Today, Vocale Ltd (owner of The SIP School) announces that it's WebRTC School website is now live with training courses becoming available by the end of June. You can visit the site here at www.webrtcschool.com and pre-register your interest for the programs and as a result, be sent a discount voucher when the courses go live. The Certified WebRTC Integrator program and the Certified WebRTC Developer program. Small demos of the content of the programs are now available here with more to come over the next few weeks. Support for these programs is expected to be massive from organisations around the world and already WebRTC World has endorsed the training and associated certifications. If you have any questions about this exciting new training / certification service then please send an email to graham@webrtcschool.com or use the contact page on the website. We're very happy to be offering this new service to you and very much expect it to become a great partner site to The SIP School. Today we have uploaded some new content and as well as a few other fixes. More slides on SBCs added. Hope you like the new elements and updates to the SSCA® will be applied in 2 weeks time. We're really happy to announce that Cisco have added all of The SIP School training and certification products onto their Cisco Learning Network Store. We are now officially a Cisco Authorized Supplier. This means that our reach has grown dramatically whilst also allowing people who are trying to attain Cisco certifications to study SIP in more depth than they can using Cisco's own materials. Networking 4 VVoIP where VVoIP stands for Voice and Video over IP. All modules have had an update with most having new content added with special attention paid to Voice over IP. As well as the existing modules we have added three new ones. These are really important areas in the world of networking and Unified Communications and by their inclusion, this training program will continue to be the foundation that suits all manufacturers, service providers and dealers that work with Data and VVoIP. The full course outline is here and the course demo is here. What is noticeable is that the price has not changed despite the extra material and all holders of existing Networking 4 VoIP licenses will see all the new material for free. Regarding the certification test, the SSVP will be replaced by the SSVVP on the 29th of Novemeber. This gives people who have just finished studying for the SSVP time to take the test before it is updated with new questions that relate to the new content. Press Release: "SIP Certifications, an Industry Standard at 1000+"
The SIP School has awarded the 1000th SIP School Certified Associate (SSCA). The SSCA is the leading vendor-neutral certification for networking professionals that is globally recognized and has become the SIP certification to attain. SIP certification involves a series of online SIP training modules followed by an extensive online test of the technologists understanding and application of SIP. Becoming a SSCA demonstrates that the recipient can work effectively in the VoIP environment and SIP’s migration into support Unified Communications. The SIP training program is specifically designed to not only educate on SIP but teach people how to work with confidence in situations that may be completely new to them. Use the discount code “1000SSCA” when purchasing the training and taking the test. Certification can help the employee in many ways including job prospects, job promotion, higher standing in the telecom community along with the confidence that their training and certification gives them the skills to adapt as SIP evolves. When hiring, 68% of IT managers regard certifications as medium to high priority according to the largest vendor-neutral certifying organization, CompTIA. Getting certified is fast and easy. Networking professionals can obtain the SIP training and then go on to take the SSCA test. If the professional already has the knowledge, the SSCA test can be taken separately without taking the SIP training modules. The SIP School course descriptions can be found at http://www.thesipschool.com/courses/view which has course outlines and demos. Advice for selecting the best SIP training for the professional can be found at http://www.thesipschool.com/whichtypeareyou.html. The SIP School is the web’s leading SIP training and Certification service that has quickly gained the backing of manufacturers and organisations that are prominent in the Telecoms industry. SIP, which stands for Session Initiation Protocol has become the most important protocol in Voice and Unified Communications today as it is built into handsets, PBX systems, gateways, and is also displacing traditional digital and analog lines with SIP trunks. Its importance to the Telecoms industry cannot be understated. Educated professionals are crucial to its development, hence the success of The SIP School programs. With clients and partners such as Cisco, Avaya, Toshiba, Mitel, Panasonic, Acme Packet, AudioCodes, Bell Canada, British Telecom, NEC and many others it’s easy to see why The SIP School has become the provider of choice for education and with the backing of the TIA, it is firmly established as the world leader. Here at The SIP School we're proud of all of our associations and partnerships which have helped us to established our training and SSCA® SIP certification as the industry standard. Well, we now have another one and it's massive..! USTelecom, "the nation’s premier trade association representing service providers and suppliers for the telecom industry" has now partnered with us to provide access to our SIP programs via their own website at http://www.ustelecom.org. In cooperation with The SIP School™, USTelecom is pleased to offer online training in the Session Initiation Protocol (SIP), the foundation of voice communications all over the world. SIP is the underlying protocol of VoIP, voice over LTE and is the fundamental building block of the IP Multimedia Subsystem (IMS) architecture. USTelecom members receive 10% off retail course/exam prices. Please login to the USTelecom website to see the members only discount code. Not sure if you’re a member? Contact USTelecom membership at membership@ustelecom.org or call (202) 326-7361 for the discount code. So there you have it. Another great partnership setup and we'll keep you posted on some others that are about to go live soon. Made it before the end of June - Phew! SIP Communications for Sales and Marketing professionals has now been updated and the new elements of the training are now live. There is a lot of valuable information in this program that will help Sales and Marketing people see what's happening in the market in order to build their own offerings, target their clients and make sales. Hope you enjoy the updates! After a busy March, please check out the new blog entry that includes information on a free Video presentation "What's up with SIP?" New content in the SIP SSCA® Program - Check it out..!!! We're really pleased to say that all updates are now Live! What this means is that some of the training modules have had some new content added (as per The SIP School promise) to keep the program up to date and fresh. Please take time to revisit the modules to see the new stuff. The SSCA® exam question database will not be updated until the 9th of March so if you have already revised the program and are looking to take the exam then you will not be affected until this date where a 'New' question may pop on the screen. SSCA® in English, German and Spanish...! We’re working hard on getting language support up and running for the SSCA® certification test and it’s now live in English, German and Spanish. We’ve got more languages on the way and any suggestions are welcome. As the provider of the global standard in SIP training and certification, The SIP School has taught thousands of employees in the telecommunications industry how to better support their clients, products and services. Until recently, students training to become an SIP School Certified Associate (SSCA®) were instructed in their first session to create a SIP address with any free service. Today, The SIP School announces another option by working with OnSIP as their SIP service provider – leveraging the OnSIP API to provision each student with a SIP address on thesipschool.com domain. OnSIP originally began SIP domain hosting to encourage their customers to simplify communications and boost their corporate branding by creating SIP addresses for employees that match their email addresses. With the OnSIP API, customers can integrate SIP address provisioning into their own service offerings as The SIP School has accomplished. “OnSIP is offering a fantastic service that we wanted to make available to our students to help them in their SIP studies,” said Graham Francis, CEO of the SIP School. “We provisioned thousands of existing student accounts using the OnSIP API, and every new student that signs up for training from now will automatically get their new SIP account provisioned for them again via the API. OnSIP made it really easy for us to do this, and it’s a service we recommend highly”. To learn more about SIP, visit http://www.thesipschool.com. For SIP services and business phone services, visit OnSIP.com. Having helped over 10,000 customers, Junction Networks is a leading provider of business VoIP service to small and medium-sized businesses. OnSIP, by Junction Networks, is an intuitive and reliable business phone service on the Internet for companies with 5 to 100 employees. OnSIP customers enjoy the benefits of a business class phone system, without the traditional high cost, burden, and inflexibility. For more information, visit http://www.onsip.com. The SIP School is the global leader in SIP education with over 5,500 students registered for its training programs. It is the issuing authority for the SSCA® Certification that is endorsed by the Telecommunications Industry Association along with many manufacturers of SIP devices and providers of SIP based services. For more information, visit http://www.thesipschool.com. It's been a while since a news item was placed here and the frustrating thing is that there is so much to announce that we can't announce yet. We cant announce until January 2012 our new SIP partner who is helping us to provide all students @thesipschool.com SIP accounts. And we can't annouce the new work were doing with a giant in Telco where we're producing some new content for them? FRUSTRATING..!!!! But of course, we will announce all these things when Press and Marketing staff have done their stuff. So until then, it's a big thanks for being a supporter of The SIP School and have a great Holiday! Brand new content going live this week! So after a few months of hectic writing The SIP school is pleased to roll out its latest updates to the SSCA® SIP training program. There are the usual changes due to the ever evolving nature of SIP but most notably this time around is a brand new module on SIP and Fax over IP and quite a revamp of SIP trunking, which of course is the one thing everyone talks about in the industry. We felt that a module on SIP and Fax over IP was much needed as people are finding that the service works well, badly or not at all and as Fax just doesn’t seem to want to go away then it’s got to be made to work over SIP trunks. The module teaches the basics of faxing, the transition to Fax over IP, the main FoIP protocols available and then heads off into troubleshooting and testing. We hope that this module proves a hit and enables people to cope with this old technology running over brand new links. SIP trunking has also been updated quite a bit with the inclusion of an ITSP checklist. This list is designed to be a guide for people who are looking to sign up for SIP trunking services but are not sure how to start and what questions to ask. It’s not an exhaustive list but we think it’s a good ‘stake in the ground’. Anyone who uses the list and wants to offer suggestions for improvement will be helping everyone out as again, we’ll keep it updated. Westcon Group - Shouting from the hilltops! We've been associated with Westcon in the UK for around 6 months and now we're partnered with Westcon in the USA. Westcon are Avaya's largest distributer in the states and have partnered with us to get people up to speed on SIP. Recent announcements to the press are all here and it's great to see such enhusiasm for our program from a global presence such as Westcon. "SIP Communications for Sales and Marketing professionals" is now Live and replaces the old SIP Trunking for Sales/Marketing program. The reason being is that we've added in content to cover Unified Comms and Hosted PBX so it's not just about SIP Trunking anymore. 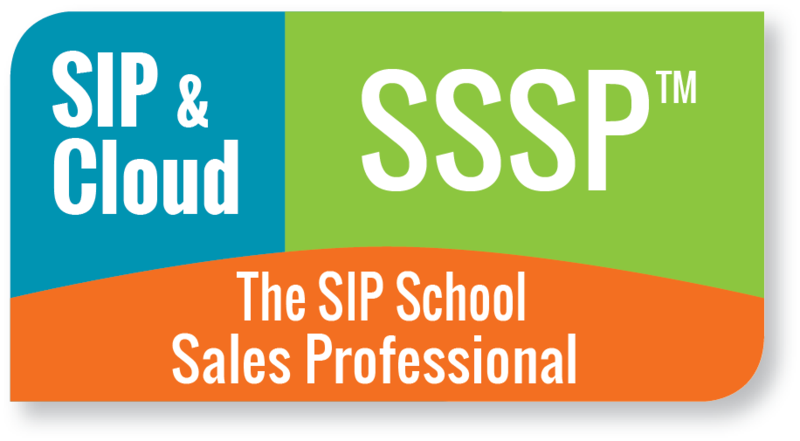 The new certification name / logo - SSMP™ stands for SIP Sales and Markeitng professional. Any existing certified user will be able to see the changes on their certificate right away. The SIP Survey 2011 - The results are in! In February, The SIP School in association with Techistan carried out a survey to find out what's really happening in the world of SIP and SIP trunking. In fact we wanted to see what problems people were getting and work out what people need to do in order to get SIP Trunking right the first time. We found that problems ranged from Codec issues, No - Audio, Failure to keep systems patched, Call transfer issues and many many more. And this is in an industry that has the ambition to displace TDM Trunks completely...!!! With comments and insight from AudioCodes, Avaya, the SIP Forum, Mitel, Level 3, Ingate, Broadvox, Sonus Networks and more, you should download this report, grab a coffee and take 10 minutes to find out what's really going on out there and to make sure that you don't fall foul of some of the issues we found. To get access to the full report, please register on our mailing list and we'll send you a link right away. http://www.thesipschool.com/connect.html - If you are already on our mailing list, you'll be receiving the link shortly. Saint Louis, Missouri, USA - February 14, 2011 - The SIP School continues to establish itself as the provider of the global standard in SIP Training and certification by gaining a major partner in SoTel Systems. Based out of Saint Louis, Missouri, SoTel offers SIP services from trunking to collocation hosting services. Contributing to truth and business development in VoIP and SIP-related business is a quest of The SIP School, Techistan online magazine, DIDXchange and thousands of others who will participate in Enterprise Connect Feb. 29 - March 3, 2011 in Orlando, Florida. The trio will use this opportunity, of the gathering of brightest minds, organizations and ideas, to share results of the complete cycle of months of systematic observation, measurement, experiment, formulation, testing and modification of the industry's experience with SIP (session initiation protocol). One of the main themes of the conference program will be SIP and SIP Trunking, which is the focal point in The SIP School's inquiry and study, but also Mobility, Unified Communications, The Cloud and Virtualization, and Planning and Implementation of IP Telephony. Graham Francis, CEO of The SIP School and a Telecommunications Editor of Techistan magazine states, "We are prepared with a strong focus. The industry is about more than Edge devices, session border controllers and SIP trunking. We want to know what people and organizations feel is difficult in the world of SIP as they attempt to get started. When the 'players' need help, who do they turn to? Service providers? What kind of support do they receive? Where are those service providers not meeting the needs?" A survey is being shared across popular social media such as Facebook, Linkedin, Twitter and blogs that millions of businesses use. The goal is to query regarding issues, best practices, and new ideas from those in the middle of the Internet protocol-based, hybrid, and pure PSTN communications sectors. After a careful study of the data, a follow-up survey will be shared with the original participants. Mr. Graham will notify them directly. "Graham already has dozens of appointments with service providers scheduled during Enterprise Connect (formerly known as VoiceCon). He will share the results of this careful study with vendors, service providers, MSAs, highly respected industry consultants, exhibitors, and other presenters at the event," Suzanne Bowen, Vice President of Techistan online magazine and the DIDXchange. "Our companies are working together as press at the conference with a mission. It is to assist participants to discover concrete and essential ways to improve, expand, and innovate in what often feels like a volatile, chaotic atmosphere ... that of communications in general." empowerment. Most parties involved (vendors, service providers, end-users) may have the benefits of decreased communications cost and increased opportunities for generating new revenue because of replacing PSTN with SIP. Visit www.The SIP School.com, www.techistan.com, www.enterpriseconnect.com/orlando, and www.didx.net for more information about the parties involved in the SIP survey and its final provision of SIP best practices and issues data. Other events where the public can meet with The SIP School, Techistan and DIDX include CTIA Wireless in Orlando, Florida March 22-24, 2011; Mobile Content Summit in New Delhi, India February 25, 2011; and East Africa Com in Nairobi, Kenya April 5-6, 2011. On the surface, SIP trunking is an attractive alternative for nearly every enterprise ... the benefits are compelling. Yet, questions about cost, reliability and interoperability remain for most enterprise IT execs faced with the decision to implement. Voice Report, in conjunction with BizTechReports, an independent reporting agency that covers enterprise technology trends, asked executives across dozens of industries to provide input regarding their adoption and utilization plans for SIP trunking within their enterprises. While a little more than one-third of our respondents are currently implementing SIP trunking services in a substantial manner, 56 percent plan to increase their investments in this technology in 2011. This positive adoption trend is occurring despite the presence of significant levels of confusion and trepidation about SIP trunking. This session called The Secrets of SIP Trunking is designed to make companies who are looking to implement trunks think hard about what they need to do to prepare their network and what they should expect from their service providers. Networking 4 VoIP is now Bicsi recognised. Formally known as the Lan/Wan for VoIP course, Networking 4 VoIP is now worth 6 Bicsi CEC credits so is even more valuable to the student who passes the certification test. Also, pass the test and use the SSVP letters on your business correspondence, yes you are now a SIP School VoIP Professional. For now, all the content is exactly the same but we'll be embarking on a content 'refresh' program that will be rolled out in stages up to and including Q1 2001. Due to various factors, the session called 'SIP in Action' due to run on October 4th at ITEXPO in LA has moved to Oct 5th at 2:00pm and is co-located in the Ingate room. Please note the change in your diary if you are planning to visit. The SIP School continues to establish itself as the provider of the global standard in SIP Training and certification by gaining a major partner in Acme Packet. Acme Packet with their extensive NET-NET family of products, enables the delivery of trusted, first-class interactive communications—voice, video and multimedia sessions—and data services across IP network borders and has 1105 customers in 105 countries which includes 91 of the top 100 service providers in the world; and 11 of the Fortune 25. “The SIP School e-learning program is a great choice for companies who need to get their people trained on SIP whilst looking to slash travel and subsistence costs”, he said. Francis added that The SIP School has been updated constantly to keep up with the ongoing development of SIP since its launch in 2007 and is confident that the inclusion of modules such as ‘SIP in Unified communications’ will tempt even more companies to join up. “We have more ‘industry giants’ evaluating our SIP training and SSCA® certification program and we will be announcing further endorsements over the coming weeks”, he said. October 4th - 2:15PM and it's FREE to attend! At this point, the SIP network is up and running, but what about if things go wrong? Learn how to Market and Sell ‘SIP Trunking’. The SIP School, in conjunction with Maloff NetResults, today announces the general availability of a new on-line and interactive training program entitled “SIP Trunking for the Sales and Marketing Professional.” This three-module course is designed to provide critical information needed by both marketing organizations and sales personnel serving this burgeoning global marketplace. The three modules consist of The SIP Trunking Marketplace, SIP Trunking Service Development and Management, and Selling SIP Trunking Services. One of the highlights of the third module is a SIP trunking cost justification template that has been created both as an example and as a model for use in actual cases. Graham Francis, CEO of The SIP School said “we are extremely excited to be working with Maloff NetResults as their experience has enabled us to bring to the market a training course that is completely unique as no other course like this exists. I also think that the cost justification template is a great tool that will help the sales person show actual savings that SIP trunks can bring rather than picking a figure out of the air which I believe a lot of people do which can be misleading”. Explaining the STCA™ certification, Graham also said “becoming a SIP Trunking Certified Advocate can prove to employers and clients that you understand how SIP trunking has become so important an alternative to traditional business lines“. To gain access to the course, people will need to visit The SIP School’s main site at http://www.thesipschool.com and click on the ‘Course Catalog’. Here they will see the list of courses available and be able to make the appropriate purchase. Maloff NetResults is an Internet and business consulting organization, focused on emerging Internet telephony technologies such as SIP, SIP trunking, and hosted PBX/cloud communications services. The company also specializes in information systems security policies and plans, development of RFPs, and technology project management. Clients include both technology companies and enterprises seeking to apply these technologies. The SIP School™ today announced that has joined the Internet Telephony Service Providers Association in the UK. Graham Francis, CEO of The SIP School said, “Joining the ITSPA is important to us for a number of reasons. First, we want to support the efforts of the ITSPA in its efforts to encourage the development of the VoIP industry in the UK and Second, to help us gain more visibility to the members of the ITSPA to assist them in their SIP and VoIP training needs”. The SIP School™ with its SIP training and SSCA® program has become the world leader in SIP education with endorsements and partnerships with the likes of the TIA, Bisci, Mitel, Panasonic, Audiocodes, Avaya’s DevConnect Community, Telematrix, AudioCodes, Ingate and many more. The SIP School™ announces today that CEO, Graham Francis will be presenting at UCEXPO 2010. Free to all UCEXPO attendees, the presentation will be held March 10th 15:10, 2010 at Olympia, London, UK. The seminar called “Deploying SIP Trunks – Getting it Right the First Time”, will take people through a series of steps that they need to follow in order to implement SIP Trunks into their business so that they work first time and will pave the way for a successful transition from traditional links. Graham Francis says “SIP Trunking is already popular yet 2010 will see implementation numbers rocket! Everyone wants the cost savings that SIP Trunks promise but if people don’t do their homework then installations can be messy and end up costing more. This seminar gives people the insights into deploying SIP Trunks quickly and effectively so that they can start saving money right away. The SIP School™ announces today that CEO, Graham Francis will be presenting at the new SIP Trunk Summit at ITEXPO East 2010. Sponsored by Ingate® Systems with TMC, these educational seminars bring together leading IP-PBX vendors, SIP trunking service providers and industry thought leaders to provide a comprehensive overview of SIP trunking with key issues faced by enterprises, carriers and VARs today. Free to all ITEXPO attendees, the Summit will be held January 20-22, 2010 at the Miami Beach Convention Center in Miami, Florida, in room A108/A109. The seminar called “Deploying SIP Trunks – Getting it Right the First Time” running on Friday the 22nd @ 10am, will take people through a series of steps that they need to follow in order to implement SIP Trunks into their business so that they work first time and will pave the way for a successful transition from traditional links. The SIP School has gained another great client and endorsement for its SIP training and Certification program and this time it’s the Colorado-based telephone specialist, TeleMatrix. TeleMatrix is a leader in the provision of telephones to the commercial, hospitality, and health care markets. TeleMatrix has over 7 million analog, SIP and Digital Centrex telephones installed at over 30,000 customer sites worldwide. The modules include training in areas such as TCP/IP, IP addresses, Switches and VLANs, DSCP and QoS, SIP Server functionality, Time Server, DHCP and TFTP. The course also includes material specific to TeleMatrix products such as the IP Mass Configuration Utility Installation, and IP Mass Administration Utility (Overview, Setup, Discovering Phones, Checking Status). This will be enhanced with a secure Knowledge Server for TeleMatrix products accessible only to Value Added Resellers that meet TeleMatrix SIP certification requirements. “Our SSCA™ certification is certainly the only one worth attaining regardless of which training company you choose to use as it’s now recognised by so many important companies and organisations around the world”, states Graham Francis, CEO of The SIP School. TeleMatrix, Inc. is a certified Minority Business Enterprise (MBE) and leading ISO 9001 and RoHS-certified manufacturer of SIP corded, DECT SIP cordless, analog, and Digital Centrex telephones for hotel, education, health care, and general business applications. Through the 2006 merger of TeleMatrix and Scitec, the combined companies have deployed 7 million telephones at 30,000 commercial customer locations worldwide. The SIP School has gained another big ‘thumbs up’ for its SIP training and SSCA™ certification service and this time it's from Alan Percy the Director of Market Development at AudioCodes. Graham Francis, CEO at The SIP School said: “Getting a recommendation for our training and certification from someone with the standing that Alan has in the world of SIP and VoIP is just great news for us and it again shows that forward thinking companies understand the need for top class training on SIP along with a method for proving skill levels through our SSCA™ certification program. AudioCodes Ltd is based out of Israel with locations all over the world. They design, manufacture and sell advanced Voice over IP and converged VoIP and Data networking products and applications to Service Providers and Enterprises.